The African Scholars for Knowledge Justice (ASK Justice) Project seeks to contribute to positive policy change to increase access to medicines and access to knowledge. The project sets out to build a strong network of engaged faculty members at Southern and East African universities who through research, teaching and public voice from a human rights perspective influence current and future Intellectual Property law and policy reform processes in Africa. A better understanding of the under-explored interface of Human Rights, Intellectual Property and the Public Interest is expected to lead to positive policy change, and integrating this understanding into mainstream teaching and research will make teaching and research in this area more sustainable. The project is carried out by participating faculty from the Universities of Nairobi, Strathmore, Makerere, KwaZulu-Natal and Cape Town. Institutionalising Open Data Practice in Africa. As governments and other institutions open up vast and complex datasets the expectation is that there will be widespread benefit as a consequence. There are, however, several stumbling blocks in the path of extracting the benefits of open data. This project focuses on the organisational dynamics that have the propensity to prevent open data practice from being embedded in organisations. With its focus on developing country contexts, the project aims to contribute to our theoretical understanding of change processes in organisations and provide insight into the socio-technical conditions under which open data initiatives in public agencies are likely to succeed. This project will develop a set of indicators which will gauge the extent to which open data practice is being embedded in a sustainable manner in public organisations. These organisations will be selected at both national and city level in South Africa and Kenya. Central to the indicators developed will be the licensing of open datasets as evidence of a normative acceptance at multiple organisational levels of the value of open data. The project is a collaborative undertaking between the World Wide Web Foundation and UCT, with seed funding from Canada’s International Development Research Centre (IDRC). The IP Unit is involved in a project carried out under the Open and Collaborative Science in Development Network (OCSDNet). The ‘Empowering Indigenous Peoples and Knowledge Systems Related to Climate Change and Intellectual Property Rights’ project examines processes of open and collaborative science related to indigenous peoples’ knowledge, climate change, and intellectual property. It assumes and challenges practices of open and collaborative science as a process, one that should involve modes of being both open and closed. Participatory action research (“PAR”) will be carried out together with indigenous KhoiSan peoples to assess the following: (1) how climate change has impacted their communities; (2) how they have produced indigenous knowledge related to addressing climate change and alternative strategies; (3) how such knowledge is characterized (or not) as indigenous intellectual property and openly shared (or not) with the outside public; (4) and what types of laws and policies (including intellectual property rights) promote and/or hinder these strategies and open collaboration with the public? This goes towards re-conceptualizing climate change, intellectual property, and indigenous knowledge not as inevitable environmental changes, natural property rights, or traditional (i.e. less valuable) ways of knowing. This project strives to understand these issues as structured by political, economic, and socio-cultural histories pertaining to indigenous peoples. KhoiSan youth will be encouraged to participate in the research process to learn more about their communities and represent them as future leaders. The 2-year project is led by Natural Justice researcher Catherine Traynor, who explains the project in this YouTube clip. The Open African Innovation Research and Training (Open A.I.R.) Project is investing in pan-African research, networking, capacity-building and policy engagement. 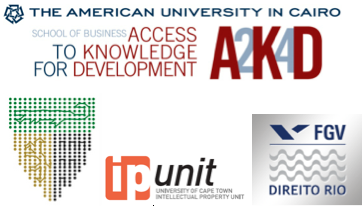 The project’s central aim is to investigate how intellectual property (IP) regimes can be harnessed in Africa to facilitate innovation through collaboration – and to make processes more participatory, knowledge more accessible, and benefits more widely shared. The project is centred around 19 interconnected, empirical case studies on conditions across the African continent, along with future-focussed foresight research. The research is laying the foundations for training provision to public- and private-sector leaders. The project’s training components aim to build capacity among researchers, policy/issue leaders and grassroots stakeholders — including innovators, creators and entrepreneurs. The training comprises seminars and workshops, the Open A.I.R. Research Fellowships programme, and development/delivery of a new course curriculum focused on IP and development. The IP Unit is the administrative centre for the project as well as its Southern African hub. A Swiss-South African co-operation between the IP Unit and the University of Applied Sciences and Arts of Southern Switzerland (SUPSI), in partnership with Wikimedia Switzerland and the Africa Centre in Cape Town, led to this NRF-funded research project that commenced at the end of 2013. The Wikipedia Primary School Project seeks to bridge a previously identified gap between existing Wikipedia content and the requirements for successfully completing the cycle of primary education in South Africa. The project will analyse and evaluate existing content on Wikipedia and enrich it with new content relevant to primary education where necessary, as well as foster the development of translations. The IP Unit is the host institution for Creative Commons South Africa. Creative Commons is a globally active non-profit organisation dedicated to making it easier for people to share and build upon the works of others, consistent with the rules of copyright law. For this purpose, it provides free licences and other legal tools. These licences and tools are the legal backbone for, among other things, many Open Access and Open Educational Resources (OER) initiatives around the world. More information about Creative Commons can be found here. 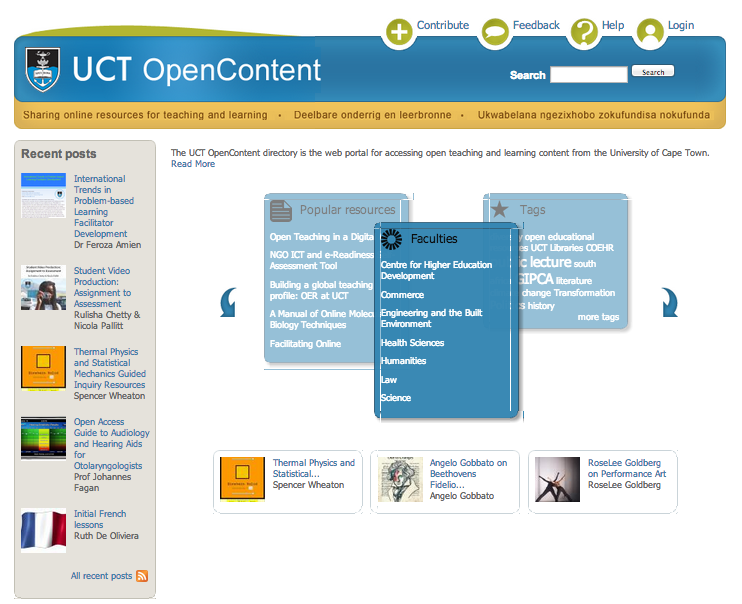 The UCT OpenContent directory is the web portal for accessing open teaching and learning content from the University of Cape Town. The IP Unit is involved in the project by providing legal assistance regarding issues relating to copyright in these online teaching and learning materials. The UCT OpenContent website can be accessed here. Global Censorship and Access to Knowledge: International case studies. Some members of the IP Unit are working with research partners from the Access to Knowledge Global Academy on a book on global censorship. This book will contain case studies from United States, Syria, Brazil, India, South Africa, Zimbabwe, Sri Lanka, North Korea, Burma and Egypt. Further details on the book are available here. The book , due to be published in December 2013, will be edited by Margot Kaminski of Yale’s Information Society Project (ISP), Nagla Rizik of the Access to Knowledge for Development Center (A2K4D) at the American University in Cairo and Carlos Affonso Pereira de Souza of FGV Rio de Janeiro, Brazil. The IP Unit is part of the Global Network on Copyright Users’ Rights which is a partnership of copyright scholars from around the world who discuss policy options and give expert guidance on the protection of users’ rights through flexible limitations and exceptions in national copyright laws. The African Copyright and Access to Knowledge (ACA2K) project probed the relationship between national copyright environments and access to learning materials in eight African countries. IP Unit members were involved as country researchers and Principal Investigators for the project. More information about the project can be found here and key research output is archived here. Yale’s Information Society Project (ISP) and the IP Unit have worked together to prepare and deliver original, nationally-focused access to knowledge (A2K) research materials. The research collaboration seeked to generate and disseminate knowledge on A2K and play a role in advocating for policy reform to facilitate domestic coalition-building and facilitate international networking. Research output included the country study Access to Knowledge in South Africa. A project on IPR and development in medicines entitled “Intellectual Property Rights and Innovation Contributing to the Millennium Development Goals”, funded by the Netherlands Ministry of Development. A EU FP7 project entitled “Nanomedicine Round Table” aimed at looking at technical and legal issues related to the use of nanotechnology in medicine. A EU FP7 project entitled “Synth-Ethics” looking at ethical, legal and public consultation around the topic of synthetic biology. The Unit was involved in several projects in Canada, funded by Genome Canada or Canada’s National Research Foundation, in relation to IP and valuation of research. In addition to the aforementioned projects, the IP Unit continues to work with relevant South African Government Departments as well as international law and policy makers on IP-related issues. We support the San Francisco Declaration on Research Assessment to improve the ways in which the output of research is evaluated by funding agencies, academic institutions, and other parties.